The Australian Outback Spectacular brings the outback to the Gold Coast in an epic show, presented by R.M.Williams. The 1000 seat arena is entirely themed to give you the feel of being immersed in the outback. The show features an array of music, amazing animals, leading stunt riders and lots of action. The story involves stations competing against one another for the prize of top station And the battle between stockmen and women of each station provides great entertainment. Enjoy the bush-storytelling and bush-poetry with renditions of Waltzing Matilda and The Man from Snowy River. And youll love seeing the amazing animals including several horses, and other favourite Australian animals including: Longhorn, cattle, camels, sheep, dogs and chickens. A three course Aussie BBQ meal is served, with menu items such as barbecue tenderloin beef steak, veggies, Australian Damper, pavlova and Bush Billy Tea. There are also vegetarian and kid options. So not only will you get the sights of the Australian Outback but you will also get the flavours too. Guests may also order beer, wine or softdrinks throughout the show. If you loved the feel of the Outback you can visit the Gift Shop for a range of outback souvenirs. 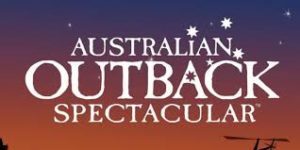 The Australian Outback Spectacular is open Tuesday to Sunday, with doors opening at 6:15pm, Pre-show entertainment commencing at 6:45pm and the show starting at 7.30pm. Australian Outback Spectacular at the Gold Coast © Warner Bros. Entertainment Inc.